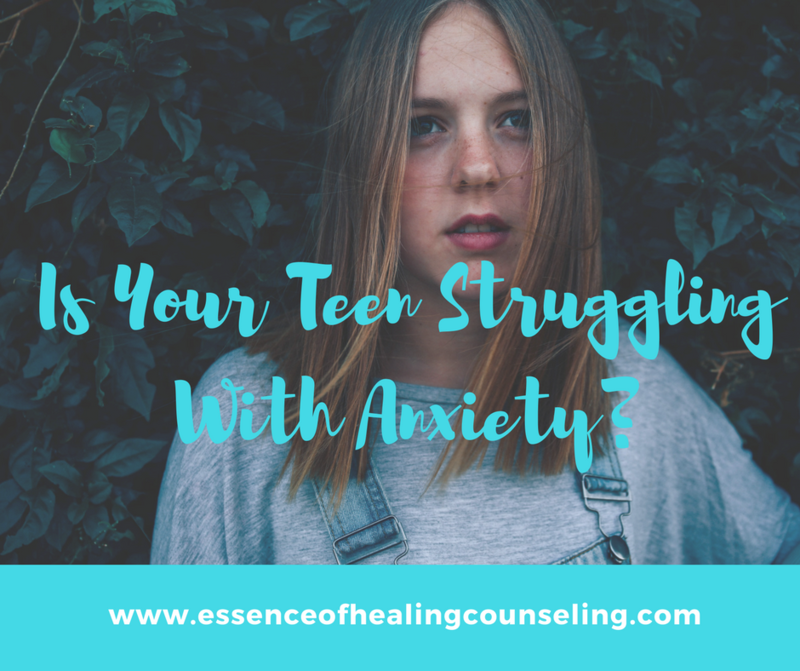 Is Your Teen Struggling with Anxiety? Does your teen constantly worry? Do they complain about feeling overwhelmed and anxious? Is their anxiety causing them to avoid school, socializing with other kids, or participating in activities? Do they get nervous when they have to take tests? A parent’s worst nightmare is seeing their child suffer. According to the National Institute of Mental Health, 25.1% of teens ages 13-18 meet the criteria for an anxiety disorder. My favorite area to work with people on in counseling is anxiety and that is why I became a Certified Anxiety Specialist through the National Association of Cognitive Behavioral Therapists. I have worked with many teens that suffer with anxiety. The most important piece of information that I can share with parents that have a teen struggling with anxiety is that you must take the steps to address it. According to the Child Mind Institute Children’s Mental Health Report, 80% of teens that have anxiety are not being treated. If a teen’s anxiety is not addressed in their adolescent years they will be exposed to experiencing anxiety in their adult years. The best way to help your teen is to find a therapist or counselor in your area that specializes in Cognitive Behavioral Therapy. This is a type of therapy that is based on scientific evidence and research. A large amount of studies have proven it to be highly effective in treating anxiety. In Cognitive Behavioral Therapy your teen will learn concrete and practical techniques that will allow them to be more relaxed when they are faced with anxiety. They will learn to stop engaging in the negative and unhelpful thinking patterns that caused their anxiety in the first place. Have an open and honest talk with your teen and see how they are doing. If they share with you that they feel anxious, worry frequently, and are overwhelmed take the time to let them know that they can get the help they need to feel better. Let them know that they are not alone and that you love them and are ready to support them. Then find a local therapist or counselor in your area that specializes in anxiety and Cognitive Behavioral Therapy. Roberta Alves is a therapist and counselor at the Essence of Healing Counseling with an office located in downtown Ft. Lauderdale. She is a Certified Anxiety Specialist and has a high success rate with helping her clients overcome anxiety. She uses a scientific and evidence based type of therapy called Cognitive Behavioral Therapy. Research has shown that Cognitive Behavioral Therapy is proven to be extremely effective in treating anxiety. Roberta is truly passionate about the work she does and loves serving her clients in Ft. Lauderdale and the surrounding South Florida areas. If you want to learn the proven techniques to gain back control of your life call 954-393-2930 to schedule an appointment.